There are now over one million copies of Bryan Lee O’Malley’s Scott Pilgrim series in print, and that’s only counting the North American Oni Press edition. The series has also achieved international success being translated into thirteen different languages worldwide with more to come! “A million copies in print is a stunning achievement,” said Ku Yu Liang, head of Diamond Book Distributors. “It’s great watching Scott Pilgrim and Oni Press grow over the years.” The Scott Pilgrim series first hit shelves in 2004 and has since gone from an indie sensation to a New York Times bestseller and most recently adapted by Universal Studios into a major motion picture, directed by Edgar Wright and starring Michael Cera. “All this for a little black & white book,” said O’Malley upon hearing the good news. “it’s an amazing success story for indie comics and I can’t thank the fans enough.” Creator Bryan Lee O’Malley and the Scott Pilgrim series have both been honored with multiple awards including the Eisner, Harvey, Doug Wright, Joe Shuster, and National Cartoonists Society Reuben awards, in addition to being named Entertainment Weekly and Wizard Magazine’s Independent Comic of the Year. 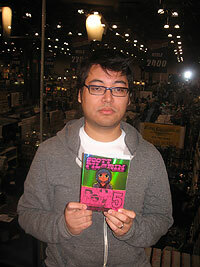 Oni Press Publisher Joe Nozemack said about the works, “I’m convinced that Scott Pilgrim will go down as one of those series that changed comics forever. When I’m out and see someone wearing a Scott Pilgrim t-shirt or sitting in a cafe reading one of the books, I get so excited about comics entering the mainstream and to know that Oni Press’ books are helping lead the way, it’s an indescribable feeling.” Nozemack founded Oni Press, Inc. in 1997 with the goal of publishing a varied line of comics and graphic novels that were missing from the market. Twelve years later, Oni is still fighting for diversity in comics by publishing one of the most eclectic catalogs in the industry. This entry was posted in 2009 Releases, 2010 Releases, General Announcements, Interviews, Media, Press Releases, Publishers by Robert Haines. Bookmark the permalink.